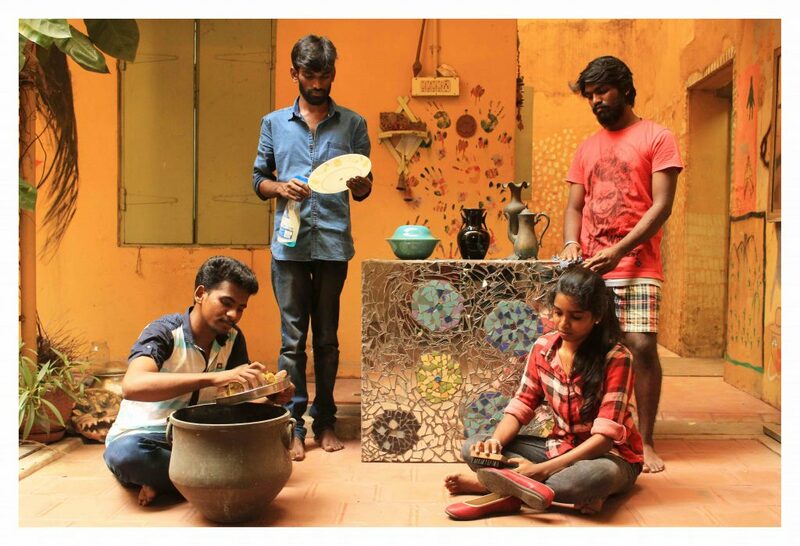 An award-winning project of student-artists exhibited in Chennai recently showed their passion for re-imagining and documenting lives of labour – theirs and others’. Thirty-three student-artists from the Government College of Fine Arts in Chennai and Kumbakonam recently showcased their visual project, ‘Archiving Labour’, among their peers, older artists and general audience at Spaces, an inclusive cultural venue in Chennai. The work of the collective was originally part of the curated Students’ Biennale, 2016-2017 which ran parallel to the Kochi-Muziris Biennale. The project fetched the collective and its curator, Krishnapriya CP, the Tata Trust’s Students’ Biennale National Award and the Tata Trust’s Students’ Biennale International Award for Curation respectively. In this piece, the curator gives the reader a glimpse of the process through which the student-artists re-imagined and placed labour at the core of their work. Investigating the history of the Government College of Fine Arts, Chennai, the first institution of its kind in the country, served as a prelude to the student-artists’ collective project. The changing nomenclature of the college, indicating its mutating identity over time, provided an axis for the students to start exploring its journey – the School of Arts, Madras, which was established in 1850 by Alexander Hunter, was known as the Government School of Industrial Arts and the Government College of Arts and Crafts before it finally got its current name, and identity, of a ‘fine arts’ institution in 2001. The college, including its classrooms and art studios, is housed in deteriorating colonial buildings. It also has a sequestered museum containing archival material which remains closed. Taking the museum as a provocation, the artists conceptualised a labour archive as a temporary exhibit in an imagined museum. Through their project of recording contemporary labour stories, they sought to present a living alternative to the colonial history of the museum. 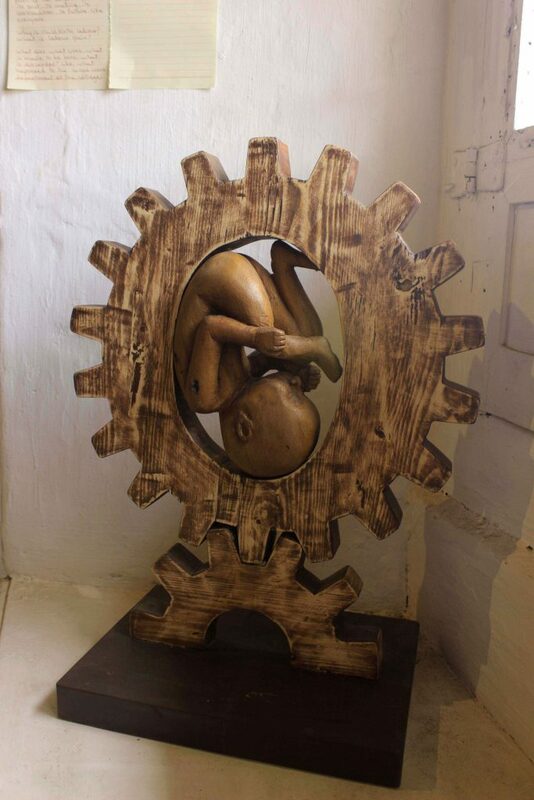 Removing themselves from the regular artistic practices of their institutions, the collective of student-artists from the Government College of Fine Arts in Chennai and Kumbakonam started researching, documenting, conceptualising and visualising labour as a lived reality and created artefacts drawing out its experiential aspects. Most of the students in the two colleges come from families that are involved in occupations of hard labour or traditional crafts, and have migrated to cities to hone their own artistic skills, some even as first generation learners. Studying their own families, people located close to them, and the work they are connected with, became the crux of the students’ endeavour. 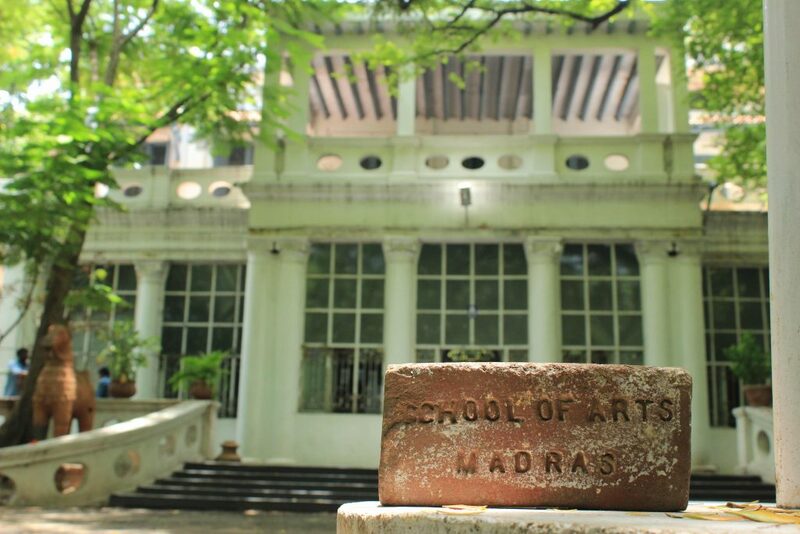 A ‘School of Arts, Madras’ brick, found in the Chennai College, presented itself as evidence of its industrial roots. In 1852, when the institution moved to its present location in Egmore, with a functioning brick kiln, it played a significant role in contributing bricks to many of the surrounding Indo-Saracenic buildings. The institution at the time comprised artisan teachers and students from artisan communities drawn from different regions of the Madras Presidency. A cast of the original brick was made by Thalamuthu (the original brick is in the college). Kameshwaran, who is studying painting, grew up seeing brick kilns in his neighbourhood in Namakkal. 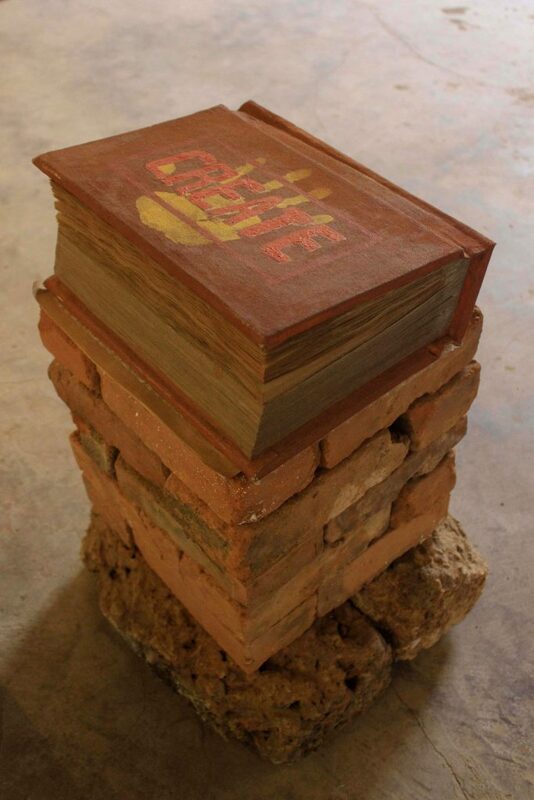 As part of this project, he registered the lives of adults and children working in the kilns by making a large sculpture of a book titled ‘Create’ with a brick inside it titled ‘Labour’. Several questions arise from this work – are brick makers not creators? What would the Madras School have been like when its emphasis was on traditional industry and craft? Who would have worked there? 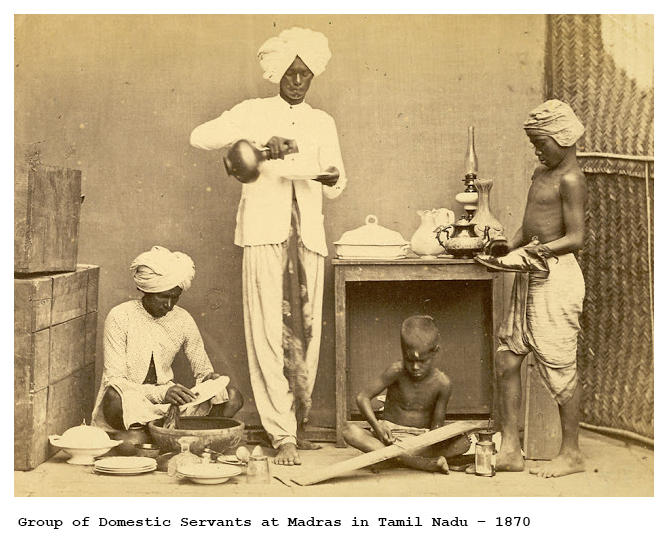 In 1855, the first photography department in South Asia and Southeast Asia was established in the Madras School. The photographs taken by this department for the Survey of India, available in the British Online Library, drew the attention of the student-artists. Taking a leaf out of the work of performer-artists Pushpamala N. and Cindy Sherman, both photographers, they ‘re-clicked’ some of the colonial photographs as a photo-performance – by casting themselves as new and critical characters within the old frame. Kamal invited Sundar, a blind man who sells sweetmeats in local suburban electric trains, to the Chennai college and encouraged him to sculpt with clay. What Sundar sculpted was a sweetmeat. With the help of other students Kamal made a video, ‘Touch of Labour’, of Sundar’s spontaneous performance. Deepika, who is studying painting, comes from a family and community of woodworkers. She worked on the idea of labour pain and childbirth, using wood as her medium. 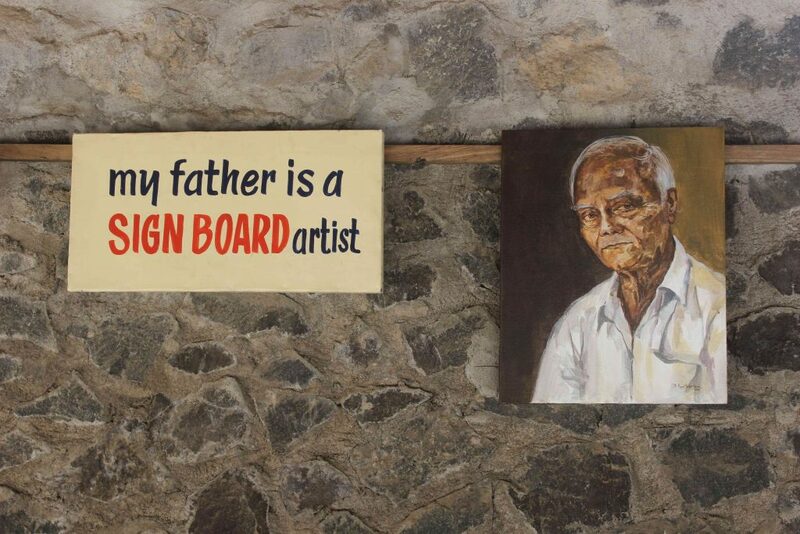 Since the once active woodwork department at the Madras School no longer existed, like most other industrial and craft departments in the college, Deepika collaborated with an alumnus of the college – carpenter Thiyagu, whose father used to have a wood workshop in the campus at one time. For her work titled ‘Womb’ Deepika learnt the intricacies of sculpting from Thiyagu, who comes from the same community as her. Unlike Deepika’s family which does not practice the craft anymore, he has continued with his family’s work. Karthick’s family makes large brass lamps, the kuthuvillakku, manually in their small-scale, home-based workshop, patarai, where the entire family is involved in intensive labour. Karthick, a student of painting in Kumbakonam, the heartland of commercial bronze casting, documented the entire process of his family’s work in an artist’s book titled Kuthuvillakku Makers. Many other artists of the collective have also artistically document different kinds of labour processes and tribulations in similar detailed books. These include Thalamuthu’s on railway track cleaners, Ayyapan’s on laundrymen, Divya’s on manual scavengers of Thiruvaiyaru, Sri Hari’s on coconut husking and Devaraj’s flip book on devarattam. Saranraj recorded the sound of labourers breaking stones in a stone quarry near his house where his parents work; he grew up listening to this sound. In his sound installation, titled ‘Sound of Labour’, he wove in memories of his personal life, aspects of his social reality and his position as an artist. He also sketched portraits of people from his small, impoverished village, among who are a 100-year-old farm worker, an old woman who sings the opari, dirge, and a man who buries and burns dead bodies. Why is history important? What can we do with it? What does it tell us about our present? What does it have to do with art making? These were some of the questions that the student-artists were grappling with following a series of conversations centred on the iconic bronze sculpture ‘Triumph of Labour’ created by Debi Prasad Roy Chowdhury, who was the first Indian principal of the Government College of Arts and Crafts as it was known then. 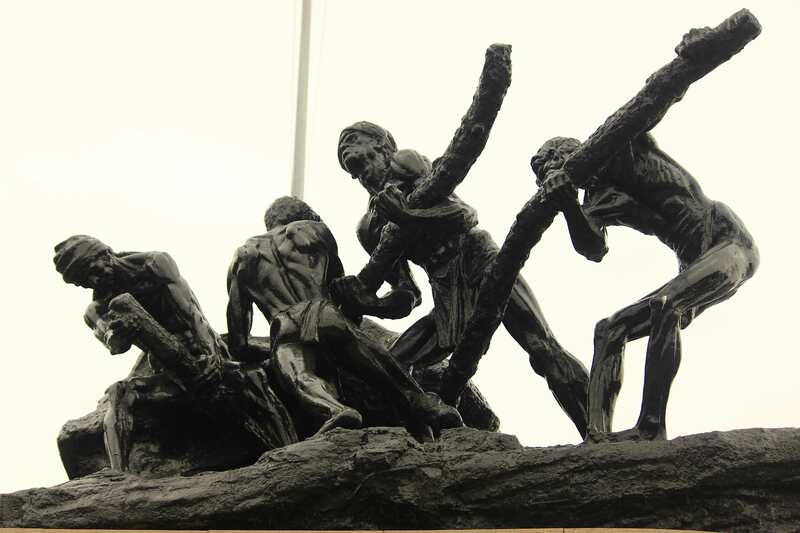 The monumental sculpture, more popularly known as the Labour Statue, was installed at the Marina Beach in Chennai in 1959 to commemorate the first May Day celebration in the country in 1923. The students engaged in an exercise of reinterpreting and personalising this labour sculpture. They developed a series of paintings with critical individual narratives focusing on what they felt was missing in the original which had sought to valorise labour. 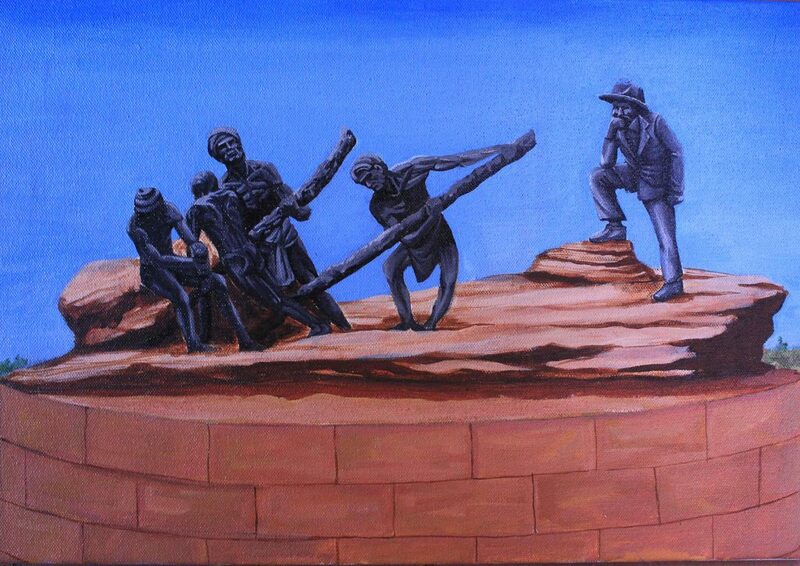 For example, Moovendhran, a student of sculpture, positioned a supervisor overlooking the four men at work to foreground several questions – who were these men working for? Is this really a ‘triumph’ of labour? Moreover, whose triumph is it? Exploring the idea of labour thus energised the group, connecting them to one another and to critical questions regarding history, labour and art. 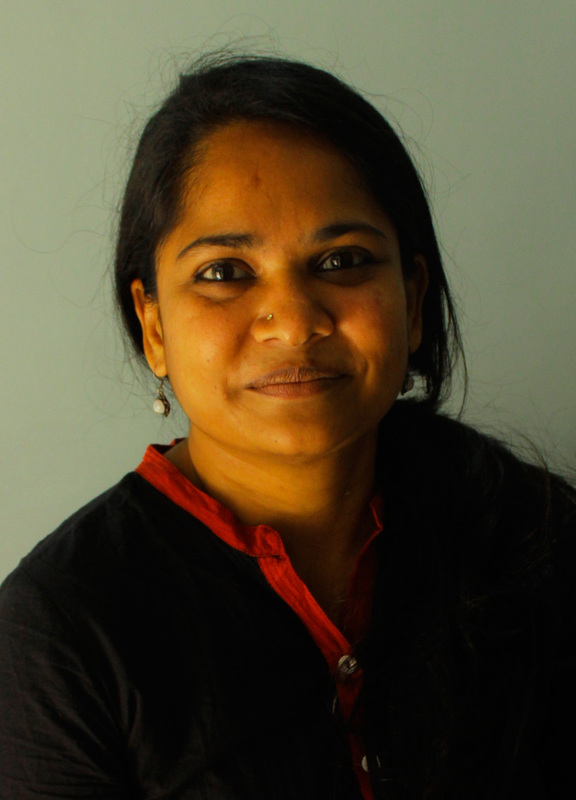 Thalamuthu is a student of sculpture interested in sculpting portraits, a strong practice within the college. 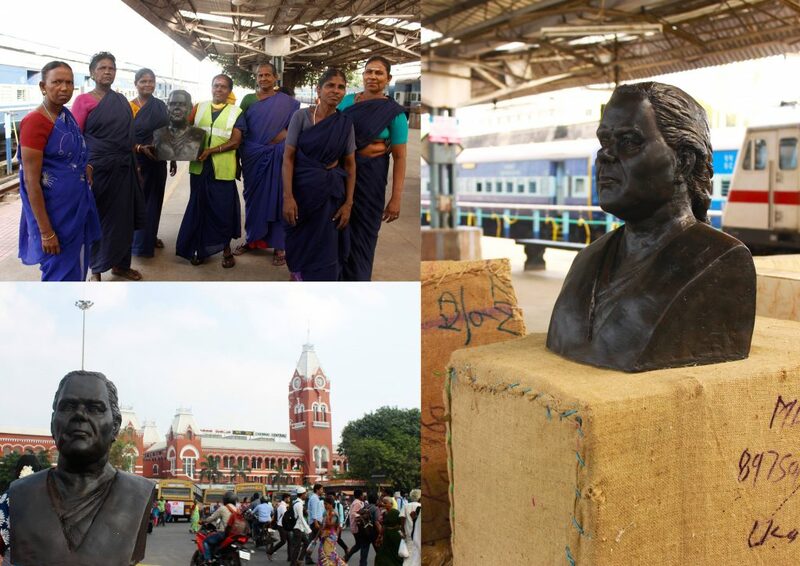 While our cities are populated with busts of political leaders and people of significance, Thalamuthu sculpted a bust of Revathy, a railway-track cleaner at the Chennai Central railway station, honouring an unknown worker engaged in work that is known but unacknowledged. Several questions arise from the work: is Revathy important enough for her portrait to be made? Who gets recognised for their work and who does not? After sculpting the portrait Thalamuthu took it to the station and displayed it there, as a public monument. Thalamuthu’s work sparked a response from within the collective. Kamal, who is studying painting, critically responded to the sculpture by writing a letter. The letter, also part of the exhibition, asks if the issue of discrimination can be addressed simply by presenting a monument of Revathy, a sanitary worker. How do we then relate to her? What does it really do to her social position? Kamal’s letter to Thalamuthu is an example of the constant engagement among the students in the collective. They were supportive as well as critical of each other’s work in discussions regarding social, political and aesthetic consequences of their works and perspectives. The above are only some of the works exhibited at the show which draws parallels between the past and the present. What had initially started as an investigation into the history of the ‘Madras School’ evolved into a documentation of the lives and socio-economic contexts of the students studying in both the colleges today. The project carries the mark of many a labourer’s life and the students’ labour as well. And yet, questions remain: who does, and continues to do, work traditionally mired in discrimination? Most importantly, did such positions go unchallenged even in the work of the student-artists which sought to treat labourers and their labour with dignity? With regard to ‘Triumph of Labour’, which was created as a national monument of strength and power, the student-artists asked if art does or can, in fact, radically rethink the position of labour in our society, overlaid as it is with class, caste and gender. As for the students’ own work, a preliminary effort that has definitely brought these issues to the fore, the question it gives rise to is this – in what way does their work address the reality that labourers will continue to toil with their sweaty bodies in the scorching sun? Further, with this project have we, the artists and the curator, been able to make a shift or has it largely remained a collective voice we have placed on record for ourselves as artists? It is in this context that we should perhaps see a collective graffiti reinterpreting ‘The Triumph of Labour’. Painted by Deepika, Kameshwaran, Sinduja, Thalamuthu and Padmapriya, the work shows one of the four muscular, labouring men in the original sculpture stepping away for a break to drink tea, a colonial drink. And there the matter rests. Krishnapriya C P is a practising artist based in Chennai. She is the curator of the visual project ‘Archiving Labour’.